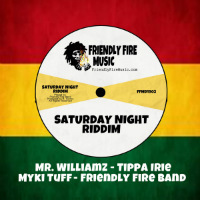 Rating: ’Ear me now – it’s classic riddim business time as the Saturday Night riddim (a de-mix of jungle cut Saturday Night by Mr. Williamz and Chopstick Dubplates’ re-played as a vocal-less reggae by Friendly Fire Band) gets not one but two limited vinyl 7 inch releases. On the first you get that very Friendly Fire Band version along with a vocal take featuring Mr Williamz lyrically celebrating the second best night of the week. On the second 45 there are two vocal takes: Tippa Irie takes the A-side, schooling Jamaican mini-bus drivers (who apparently share the same cavalier disregard for their own and others’ lives as taxi drivers the world over) with Mini Bus Man, while Miky Tuff rocks the AA flip with War General. And unusually, all versions are so good it’s impossible to pick a winner – which is to say – all versions are a winner.